Set on Florida’s Gulf Coast, Homosassa Springs Wildlife State Park is best known for its population of West Indian manatees. The park is primarily a rehabilitation center for the creatures, which swim in the freshwater spring while they are treated. On land, native Florida wildlife thrives in the dense surrounding forest. Homosassa Springs houses treasures both on land and below the water’s surface. Head to the Fish Bowl underwater observatory to see the manatees and 34 varieties of fish at close range, or board a pontoon boat to cruise the Homosassa River, keeping an eye out for gators, turtles, and otters, plus dozens of bird species. A Wildlife Walk winds through the forest, offering a chance to spot elusive wolves, bobcats, and panthers. Most tours of the park leave from Orlando and include opportunities to swim and snorkel with the docile manatees in nearby Crystal River. The park is accessible to wheelchairs and strollers, with ramps, elevators, and accessible boats and trams. Picnic areas are located along the Garden of the Springs and near the Fish Bowl. The Wildside Café, located at the park’s west entrance, offers concessions and coffee. While pets are not allowed in the park, a free kennel at the entrance offers a place to house your pet while you explore. Ellie Schiller Homosassa Springs Wildlife State Park is located off Highway 19 near Homosassa Springs, roughly 70 minutes from Tampa and 90 minutes from Orlando by road. Parking is available on site. 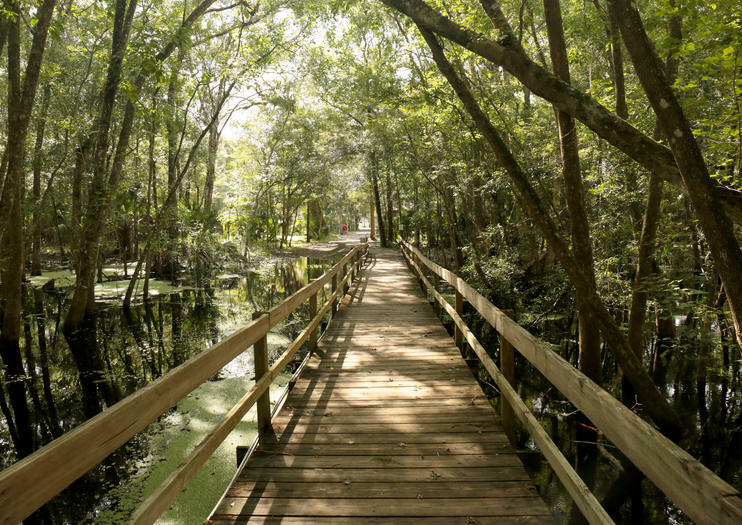 Plan to spend about four hours at Ellie Schiller Homosassa Springs Wildlife State Park to hit all the walking trails, enjoy the educational programs, and take a pontoon boat tour. Winter is an especially good time to visit because the manatee population typically peaks during this season. Also known as the sea cow, West Indian manatees inhabit Florida’s freshwater springs. Slow-moving bottom feeders, these docile animals are at high risk for being injured by boat propellers. Since a dip in population in the 1990s, the manatees have been protected under the Endangered Species Act, and their population has rebounded to around 6,000 individuals in Florida.